An ultra-fast web platform to share 3D views/BIM with just a link. 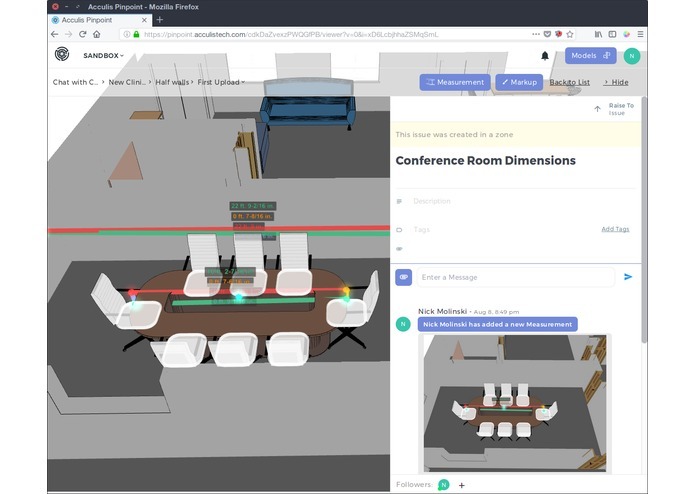 Acculis Pinpoint's simple mission is to allow people to easily & quickly share 3D views or whole models via a simple web link, in order to re-integrate those changes via a Revit and Navisworks integration. Pinpoint first got its inspiration from Darren's experience working in the Barclay's Center/Atlantic Yards project. The project yielded many problems that attributed to being over budget, but Darren's initial hypothesis was that may problems could have been solved if the BIM could have been distributed faster and knowledge gained from on-site or other contractors could provide feedback for following coordination meetings. The team has since talked to over 200 General Contractors and Architects to see how this problem could echo into forming a product. The interviews yielded what Pinpoint is today, and has garnered Acculis initial customers and letter of interests from the new platform. We are like an Asana + Bit.ly + Google Drive for construction. Anyone in a web-browser can collaborate and relay information to all parties. 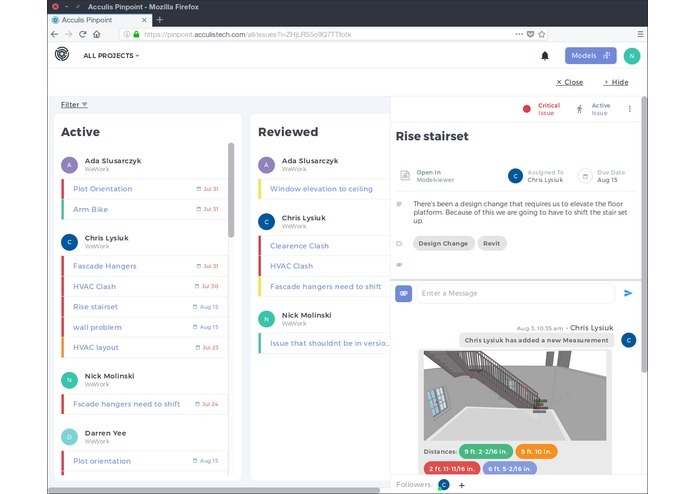 If you don't like the way the design looks, or if a clash is found and needs to be collaborated on, with easy to use tools, you can mark it up, or write it out, and share it with others via a link, to fully illustrate your design intent or clash resolution. Links allow you to share any detail, hotspot, clash or even an issue. We built integrations for Architects/Designers to directly upload their designs straight from their CAD/BIM/Design software to the web. That means less searching through emails to find what is the current design, everything is aggregated and version controlled for your easy viewing. You can even get a notification on Slack if something changes. Our two current integrations are for Revit and Navisworks. Our integrations allow you to view and upload to Acculis Pinpoint any clashes you create in Navisworks, and in Revit, allowing you to jump to the clash location and start modelling the resolution. Your design will be view-able in 3D, that means you can visualize the space, take measurements and view the meta-data of the model. Using stable modern technology and our team of rock-solid developers. Rendering Building information models is quite a challenge. These files are large, and will often crash a mobile device or laptop if they try to load. Anyone familiar with the Revit API and Navisworks API knows how much of a pain it is to work with them. We tried to hack together this product quickly for this hackathon. The industry has too many silos of information and platforms that don't talk to each other. License models for incumbent software make it impossible for true collaboration to take place. The effort required to build technology for this industry is higher than other industries. Create an onboarding workflow and user tutorials. Rendering even larger models/meta-data on the platform. send me an email and I'll create you and your full team an account to use on a project.